For those looking to experience an entirely different world on the trail, winter hiking is the way to go. Hiking your favorite trails during the winter offers many appealing qualities, including the fun of making new tracks in fresh snow and the solitude you’ll find now that most casual hikers stay indoors. 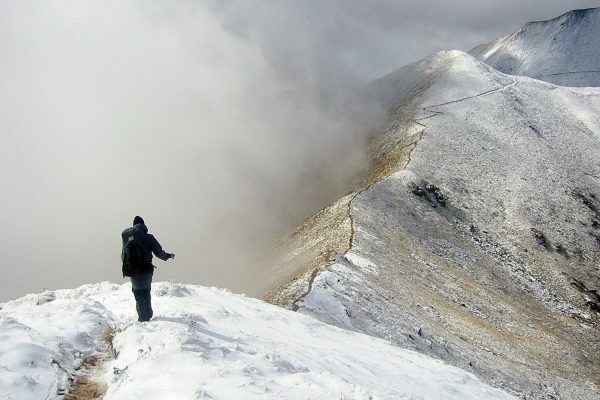 However, winter hiking also comes with its own unique risks that require some planning on your part, such as less daylight and unpredictable weather conditions. Being well prepared can make the difference between a pleasant outing and avoidable tragedy. Here are five steps to help you get ready to hike this winter. The key to hiking in cooler weather is dressing in layers. This allows you to add or remove clothing as conditions dictate. Start with a snug, moisture-wicking base layer to help keep you dry and warm. Then add a layer or two of insulating fleece, wool or synthetic materials. Finish with a wind and waterproof outer layer of both pants and jacket. Don’t forget reliable socks, gloves and a hat, as well. Avoid cotton if possible, as it stays wet, robbing your body of heat. Be sure to do some research on where you’ll be hiking well before you hit the trail. Check the weather report, including what the weather’s been like days prior, in order to see if fresh snow has fallen or if a warm front increases the risk of unstable snow. You might need extra equipment, such as snowshoes, if conditions call for it, so be prepared to rent/buy such items and familiarize yourself with them if your destination is set in stone. Experiencing a survival emergency is never Plan A, but things happen and in winter they happen quicker and in a much more serious manner. To prepare for this, it would behoove you to brush up on your emergency skills, such as starting a fire, applying basic first aid or crafting a shelter. If your travels take you to avalanche country, I’d spend some time reading up on avalanche safety, too. Winter hiking may require you to bring along season-specific gear, which you’ll also want to make sure you’re familiar with using. Bring along a first aid kit, head lamp (for those short winter days), fire-starting materials, a space blanket for emergencies, map, whistle and extra food. Bonus Tip: It may seem costly, but if you’re hiking fair distances during winter, I’d invest in an emergency beacon, such as the Spot. Whenever you’re hiking in the backcountry or camping for days at a time, it’s wise to let somebody know where you’re going, which route you intend to take and when you expect to be back. Be sure to stick to this plan, as well, as any unnecessary deviation can not only cause confusion, but also potentially create an emergency survival situation.